This article was originally published earlier this year. You will find an updated infographic created exclusively for Titan Energy customers below. The U.S. Energy Information Administration (EIA) released the latest version of the Short-Term Energy Outlook on November 10, 2015. As you plan for the winter heating season, this report, which forecasts fuel and energy prices, provides helpful insight. These are projections only, however; prices and trends can change quickly. Also, remember that these forecasts are national averages; local prices may vary. 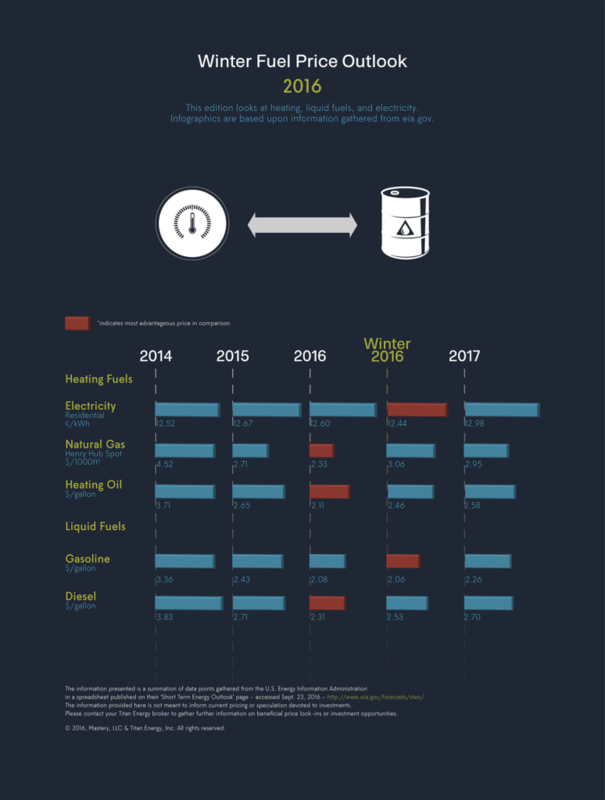 Winter Fuel Price Infographic. Get a closer look. • Natural gas storage levels are expected to reach a record high of more than 4 trillion cubic feet, which was also predicted by the Federal Energy Regulatory Commission. • Production will increase by 0.8 Bcf per day compared to last winter and peak in December, decline during the summer, recovering in 2017. • Demand will be similar to last winter assuming normal temperatures. If below normal, 1.4 Bcf/day more demand is expected; if above normal, demand will be 4.5 Bcf/day lower than the previous winter. For a complete historical and future comparison of fuel prices and trends for the winter of 2016 and beyond, see the U.S. Energy Information Administration’s STEO Current/Previous Forecast Comparisons table. Remember that weather is the biggest wild card, which can lead to price volatility. EIA expects U.S. heating degree days to be about 8 percent lower this winter compared to the previous winter.